Will Smith is reportedly being considered for the role of the Genie in Guy Ritchie’s live-action Aladdin musical. Come with me, Will. Let us pray. 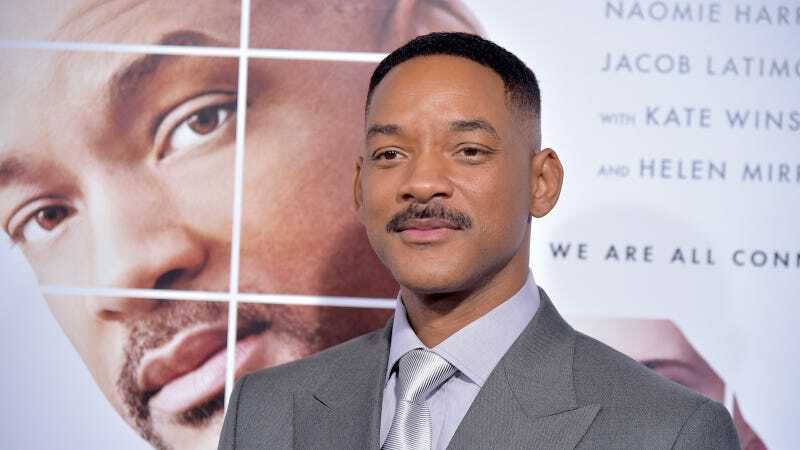 Like Beauty and the Beast, Aladdin will be a live-action musical and that would fit well with Smith who is not only an actor but was known to the world for his musical prowess as The Fresh Prince rapper before he hit the little or big screen. Fresh Prince or Fresh Bad Idea? We must take into consideration that this Aladdin role would come after a series of awful Will Smith projects that reveal an underlying disease known as bad decision-making; this includes Concussion, which was terrible in the first three seconds (I never got past 20 minutes), and Collateral Beauty, Smith’s worst opening ever and a movie that wasn’t as terrible as expected but had us wondering if Scientology made him do it. He was reportedly also on the list for Tim Burton’s Dumbo. This would probably be a bad decision. If you’re thinking about doing this movie, Will, reconsider and think about doing a different movie. It’s hard to imagine anyone topping Robin Williams’ turn as the Genie in 1992's Aladdin and, also, Will runs the risk of being the second coming of Shaq in Kazaam. What In the Hell Is This Movie?